The Vapor 55 UAV Helicopter combines the world’s most advanced autopilot with an FAA-compliant military grade unmanned helicopter for commercial, research and security applications. The Vapor 55 is a single-rotor unmanned aerial system. The Vapor 55 carries a 12 lb., front mounted sensor for up to 60 minutes on a single charge. Larger payloads can also be carried. It utilizes automatic rotor speed calibration for altitudes from sea level to over 10,000ft AMSL. The Vapor 55 was conceived to provide unprecedented ease of use for commercial, industrial, and security applications requiring larger payload suites below a 55 lb. gross takeoff weight. It is well suited for tactical use due to the system’s small footprint, superior reliability, and safety in real-life environments without modification to the vehicle. It can carry sensor payloads up to 24 lbs. 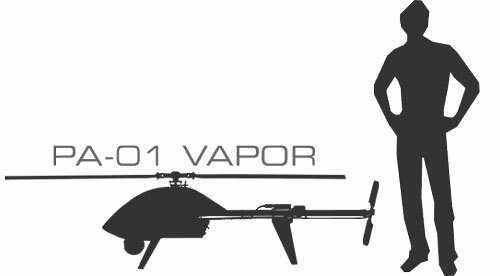 VAPOR UAV: Vapor Unmanned Air Vehicle includes: Fully functional UAS Helicopter and Handheld Control Unit. Rugged Shipping Case: Durable case with custom fitted foam inserts and easy glide wheels. Transport made simple. Ground Control Station: Laptop with ground control station software and transceiver packaged in a rugged enclosure. Battery Charging Station: Battery charging station including power supply, charger, power leads, and rugged enclosure. Will charge batteries in less than 1 hour. VAPOR Spare Parts Kit: Package includes landing gear, blade set, spare fasteners, high-wear structural components and tool set. Long Endurance Battery Set: Two sets of long endurance batteries. Each set provides one hour of flight. The VAPOR UAS can be customized in a number of ways. The following represent packages that are customized to specific applications in Security, Geospatial Applications (Mapping), and Research and Development. EO/IR Camera Gimbal: A fully stabilized (electrically and inertially) camera gimbal with options for Electro-Optical (Sony Block) and Infrared sensors (FLIR Tau 2 640). If you have a COTS camera gimbal preference, we can work with you to perform a custom integration. Payload Control Station: Laptop for controlling Pan/tilt/zoom and camera functions. Fully encrypted 256-bit, high bandwidth, Ethernet based digital data link. High Resolution Camera: Nadir mounted DSLR camera for aerial photography and geospatial mapping applications. Automatic Camera Trigger Functionality:Automatic camera trigger functionality is included in the GCS software such that you specify the field of view of the camera, and required overlap percentage. The flight control system will then trigger the camera based on GPS positions to produce the desired overlap. The PA-01 Vapor Internal Research and Development Package is ideal for universities and/or anyone looking for a custom payload integration. Custom Payload Mount: Pulse will provide the CAD models (2D or 3D) for the payload mounting locations for the purpose of mounting customer furnished equipment. Flight Control System API: Pulse will provide a control and telemetry port on the flight control system along with the API to interface with this port. This will allow users to access the flight control system telemetry (rates, angles, position, etc.) as well as feed velocity commands to the autopilot. This will allow users to use an external computer to run custom navigation loops via high-level velocity commands, while inner-loop stability is maintained by the flight control system.